Feel Bad for the Turkey? Then Don't Think about the Tuna. While the Great Turkey Fight of Aught Eight rages on, Andy Revkin helpfully reminds us to enjoy our maguro while we still can. I bring this up not just because I'm committed to talking about a food other than turkey today. But also to observe that the debate over CAFO-produced meat vs. sustainably produced meat vs. no meat at all is focused entirely on the supply side. Yes, it's discouraging to see someone I assume to be an intelligent person like Jonathan Chait essentially mock another person for caring about the provenance of the food he eats. But at least their argument isn't about how to keep from eating all the turkeys. If nothing else, we've found ways to make acres and acres of turkeys (and chickens and pigs and cows) and sell them at a heavily subsidized price. "Turkey" will survive even if today's turkey on the table, god bless its wattled soul, didn't. But the bluefin tuna? Let's put it this way: eat it while you still can. 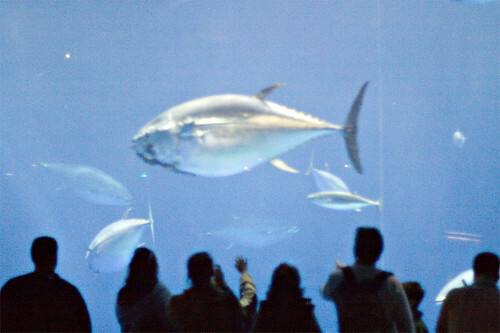 Tuna is being fished into oblivion, despite the International Commission for the Conservation of Atlantic Tunas, which sets quotas and "manages" the fishery. Replace the word "Conservation" with the word "Exploitation," and I think you'll get a better sense of their real interests. Revkin calls this managed destruction of the Atlantic tuna a "tragedy of the commons," which implies that we all just can't help ourselves from overfishing. Now, I don't know about you, but I personally haven't been fishing for tuna lately. The ICCAT represents a relatively small number of fishing fleets, all under the control of a set of sovereign nations. Some commons: this is an oligarchy. And what we're seeing is not a tragedy of the commons, but a tragedy by the oligarchy. The fishing on this side of the ocean is in tatters. The big runs of autumn, the "tuna fever," the great herds of fish thundering across the blue prairies as they rounded Montauk, that's all gone. This was by far the worst year ever. But then, that's true every year. What was different this year was that in addition to bluefin, yellowfins and albacore were nearly absent, too. What's really needed is a moratorium for bluefin, and I first said that in 1991. That's the bluefin situation. I must say that based on their whole history I would have been astounded if I.C.C.A.T. had set an eastern quota that complied with the science. I'm ashamed of what they do, but no longer surprised. This is a crisis that, if Safina is to be believed, has been a long time coming. And yet this elite group who control tuna fishing rights and regulations cannot stop themselves from destroying their cash, um, cow? This is clearly an oligarchy that doesn't understand that managing supply and demand are, at the bottom of the ocean, pretty much the same thing and equally important. The irony is that by creating the illusion of plenty through overfishing, the fishing industry creates a true tragedy of the commons among consumers. With turkeys (and meat in general) you can make the choice to eat sustainably produced meat: the competition is between different styles of, for lack of a better term, making meat. The problem at its core is too much, not too little. But with tuna you are left with what I'll call the Chait Choice, which is to say the choice not to eat. So you don't eat tuna. But then it turns out that your friends (or at least the people at the table next to you) don't have the same compunction and they eat the tuna. Which makes you feel like you should eat the tuna after all - why make the sacrifice if no one else will, and this may be your last chance to enjoy it. So you eat the tuna, too. And soon the tuna are all gone, so no one gets to eat it. Someone somewhere (like, say, Jonathan Chait) will then say that it's all the tuna-eaters fault for eating what was (and is no longer) on the menu. At which point the ICCAT will change its name to ICC-"some other fish" until those fish are gone, too. We're left feeling like the guilty gluttons who've ruined the commons. And by the way: goose, turkey or tuna, have a Happy Thanksgiving! Well, about 1 out of a million tuna fries will survive as an adult so whether there's a conservation or not, there will never be enough for us to eat.